Welcome to The Benoit Bulletin. This e-report provides updates and information on what is happening in Riverside County and around the Fourth District. I trust you will find it informative, and I invite you to share it with your friends. County Executive Officer Bill Luna presented his month-long review of the June 8 election at Tuesday's Board of Supervisors meeting. Some factors were ruled to be within the Registrar of Voters' control; some, such as budget constraints, were not. The good news is that we have a plan for future elections. Communication -- there were several communication issues that caused the greatest concern. The day after the election, although the Registrar's Web site displayed 100 percent of the ballots counted, there were still 100,000 vote-by-mail ballots left to count. I'm optimistic that better and more complete communication about the status of counted ballots will prevent much of the confusion that took place. Equipment -- the Board voted to spend $650,000 for two optical scanners, an extraction machine to open vote-by-mail ballots and a mail-sorting machine to more quickly count ballots. The Registrar also will begin utilizing signature verification technology we already own to automatically match the signature on the absentee ballot with the signature on file. "Late" ballots -- due to a court challenge the Board formally joined, a Riverside County Superior Court judge ruled that 12,563 late mail-in ballots would be counted. Due to a USPS error, the ballots sat at the post office election night and were not retrieved until the following day. The Registrar of Voters and the U.S. Postal Service are working on a formal protocol to ensure this mix-up does not occur again. Also, a state bill could possibly provide additional voting safeguards. Additionally, the rise in vote-by-mail ballots from 26 percent in 2000 to 62 percent June 8th has changed the ways elections are conducted. Some voters walk into polling places that are overstaffed and virtually empty. Gov. Schwarzenegger has signed into law SB 1342 that will adjuge to this new reality and create local flexibility in more efficiently allocating polling place resources. I will make sure Riverside County implements this change as soon as possible. On July 12, the Board held a special budget workshop, one of a few left before finalizing the budget on August 10. Some variables, such as the passage of a state budget, could adjust the county's spending plan. To keep you updated, I have created a special budget Web site that can be accessed here. As your Supervisor, I have been appointed to more than 30 boards, commissions and committees. These regular committee assignments include representing our county on the boards of the Southern California Association of Governments and Urban Counties Caucus. Earlier this month, I met with the National League of Cities board as they gathered at Riverside City Hall. This weekend, I met with officials from the United States' 3,000+ county governments at the conference of the National Association of Counties in Reno. Declining property values and deflation caused Riverside County's property tax assessment roll to decrease by 4.5 percent in the last year -- following 2008-09's 10.5 percent slide. When property values decline, state law provides certain protections for taxpayers. The Assessor-Clerk-Recorder's office completed a review of 400,000 properties and recently mailed a notice to owners with results. The review applies to the assessed value as of January 1, 2010, for Fiscal Year 2010-11 that will be billed December 10, 2010 and April 10, 2011. If your property does not meet the criteria for review and you believe the value should be lowered, the Assessor's office is encouraging you to file a Decline-in-Value Reassessment Application, which can be located here. The filing deadline for a Decline-in-Value Application for FY 2010-11 is September 1. Blythe Day: Last week, I dedicated a day to visit the Blythe area and tour numerous sites, including the airport, fire stations, and economic development projects. 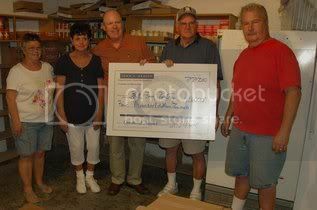 During my visit, I presented a $5,000 check from the County of Riverside to President Jim Green (to my right) and volunteers of the Blythe Emergency Food Pantry to assist their efforts in providing food to local families. CVWD Irrigation Clock Program: The Coachella Valley Water District Weather Based Irrigation Controller Rebate Program was created in 2005. This water conservation program has been highly successful, saving an average 131 gallons per day per clock, a savings of 26 percent. Recently, I contributed $2,500 in Community Improvement Designation funds to expand this program to serve CVWD customers in unincorporated areas. The smart clock rebates are installed on a first-come, first-serve basis. To apply, download the application from CVWD's Web site here. These are also available for residents in participating cities (Cathedral City, Indian Wells, La Quinta, Palm Desert, and Rancho Mirage) . PDHS Baseball: On June 5, Palm Desert High School's baseball team became the first desert team to win the CIF title, earning the championship after a 9-0 shutout, the team's 18th consecutive victory. 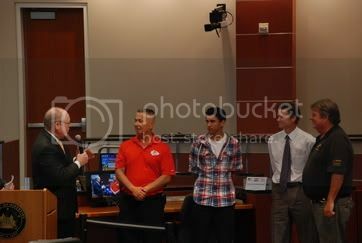 I was honored to add to their accolades with recognition at the July 13 Board meeting! Thank you for taking the time to read these periodic updates. It is an honor to be your representative on the Riverside County Board of Supervisors.